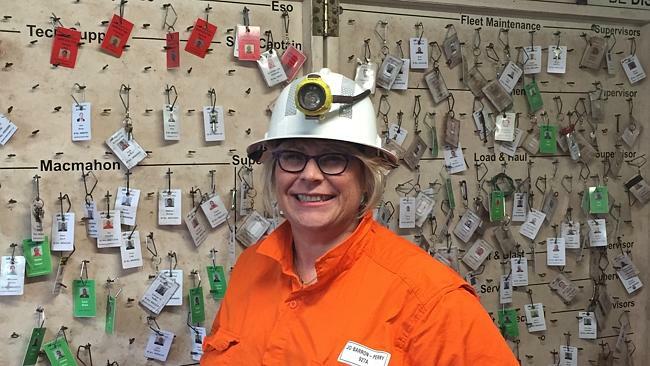 Jo Barron-Perry, BHP’s senior mining engineer at the Olympic Dam operations. Picture supplied by SACOME. WORKING deep underground at Olympic Dam in the harsh South Australian Outback would seem like no place for a woman in the minds of traditionalists. But Jo Barron-Perry has proved them wrong by not only making it her place but also taking a leadership position and encouraging more women into the resources sector. The senior mining engineer’s spearhead role into the tired old male domain was acknowledged today through her winning two categories in the inaugural SA Women in Resources awards — the gender diversity champion and the exceptional woman awards. retention and advancement of women,” said Aimee Chadwick, chair of the Women in Resources SA committee. For the past three years, Ms Barron-Perry has led a team involved in expanding underground operations in part of the Olympic Dam copper, gold and uranium mine. The team has been in charge of infrastructure underground to facilitate the expansion and managed capex projects under $2 million. Appointment to that role, which was made redundant in site changes this month, was based on Ms Barron-Perry’s more than two decades in resources as a mine engineer at BHP, Rio, WMC, Centaur and others. While juggling work, family and community life, Ms Barron-Perry also has served on state, national and industry groups supporting women in resources. The judges said they were impressed by her work “attracting and retaining women in the sector, encouraging male champions who value equality and diversity, and supporting women working and living in regional and remote areas”. Jointly winning the award as an exceptional woman in resources was Erin Woolford, from Ninti Kata, a consultancy which builds links between companies and indigenous groups. An Arrente/Kuyani woman, Ms Woolford was formerly superintendent of indigenous programs at Olympic Dam. She organised 130 Aboriginal recruitments at Olympic Dam. The leading tradeswoman award went to Sabrina McKenzie, plant operator for Thiess at OZ Minerals Prominent Hill mine. “Sabrina is an excellent role model for the resources sector and has broken new ground as an Aboriginal woman in a male-dominated industry,” said judge Terry Burgess, former chief executive of OZ and now president of the SA Chamber of Mines and Energy. Senior Reserve Engineer Helena Wu was named exceptional young woman in resources while her employer, Santos, was winner of the award for excellence in diversity programs. The Women in Resources SA awards are supported by the SA Chamber of Mines and Energy. Chamber chief executive Jason Kuchel said greater diversity in the industry delivered better business results. “These awards contribute to increasing this diversity by celebrating the ambassadors, mentors and role models instrumental in encouraging, promoting, attracting and retaining women in the sector,” he said. The awards were presented at a luncheon addressed by Toro Energy chief executive Vanessa Guthrie.